As the vapor temperature in the heat pipe is lowered, the vapor pressure drops. To carry a given amount of heat, the vapor velocity must increase, which in turn increases the pressure drop from the evaporator to the condenser. At these low vapor pressures, compressible flow effects become important. As a rule of thumb, always operate with powers less than one-half of the sonic limit. 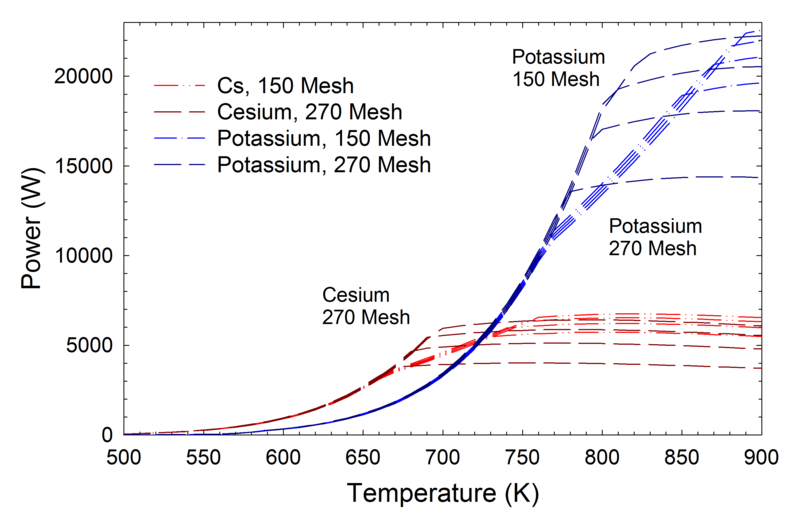 An example of sonic and capillary limits is shown in Figure 3, which compares heat pipe power versus temperature for identical heat pipes using either cesium or potassium as the working fluid. The sonic and capillary limits were calculated, and then curves using the lower of the two limits were plotted in the figure. On the left side of the graph, the maximum heat pipe power is set by the sonic limit (the roughly parabolic part of the curve), while on the right side of the graph, the maximum power is set by the capillary limit (the roughly flat part of the curve). At lower temperatures, more power can be carried with cesium, since it has a higher vapor density (and higher sonic limit) at any given temperature. Once the temperature is increased above roughly 500°C, the potassium heat pipe carries more power (for this particular design). This is the reason that cesium is normally used at temperatures below 600°C, and is replace by potassium and then sodium at higher temperatures. Figure 1. Sonic and Wicking Limits for Cesium and Potassium Heat Pipes. For these specific designs, the sonic limit controls the power below 400ºC for cesium, and below 500ºC for potassium.